Stream and listen to live concerts in MQA, analyze and enhance the sound of the M10 with Dirac Live, access new stations from Radio Paradise, and much more. BluOS 3.4.3 is all about choice. Whether it’s optimizing your living space for the best listening experience possible, or selecting hi-res quality tracks from your favorite streaming services, users now have more options when it comes to their home audio entertainment. Turn any room into your personal concert venue with nugs.net’s growing catalog of live concert recordings, featuring performances by Pearl Jam, Metallica and more. Fans of Radio Paradise also now have more stations to pick from, including their expertly curated Rock and Mellow mixes. Elsewhere, subscribers of Qobuz can now see if they’re listening to to-hi-res tracks directly within the BluOS app. Learn more about these new updates below. Experience live music at home like never before. With nugs.net now available with BluOS, you can browse and listen to over 30,000 hours of live concert recordings from artists like Pearl Jam, Metallica, Bruce Springsteen, Jeff Beck and dozens more. Hi-Fi subscribers of nugs.net will be able to enjoy their favorite concerts on Bluesound in lossless FLAC, with many of the concerts also encoded and available in MQAÒ for the best possible listening experience. Using Dirac Live’s mobile or desktop app and a measurement microphone, you can now carefully analyze and calibrate the sound of your M10 system with Dirac’s state-of-the-art room correction technology. The M10 also has the ability to store up to five filters which can be accessed directly inside the BluOS app. More stations & mixes from Radio Paradise. Tune in and enjoy four of Radio Paradise’s carefully-curated radio stations which includes their popular Main, Mellow, Rock, and Groovy mixes. Each lossless CD-quality mix is hand-built with an assortment of new songs and artists that perfectly flow together without any random computer generation. Plus, with the ability to now skip tracks and create a list of favorites, listening to Radio Paradise is even better. Browse for hi-res music on Qobuz. In the BluOS app, an HR icon has been added for Qobuz so you always know the track quality when browsing and listening to one of the world’s largest catalogs of hi-res quality music. 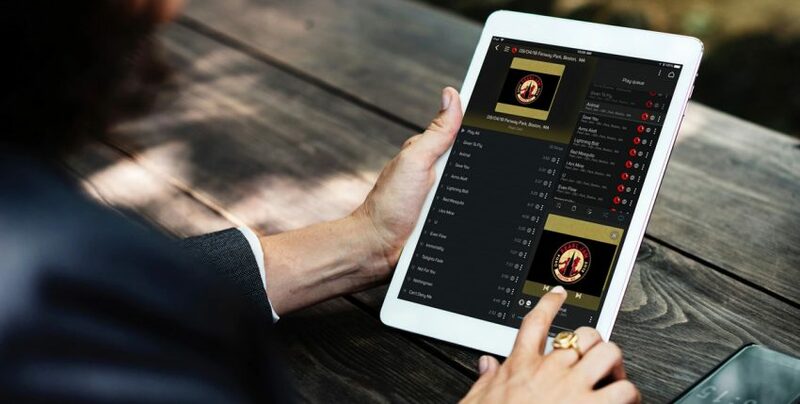 The icon will appear directly beside every 24-bit track, making it easier to quickly search for higher quality streams and find the music you want to hear at the bit-rate you love. DTS:X is the next generation object-based surround sound for NAD AVRs, bringing you a multi-dimensional audio technology to create an incredibly rich, realistic and immersive soundscape more accurately than ever before. Supported on MDC-equipped AVRs with the AM230 or AM17, DTS:X places sound all around you and offers the ability to automatically adapt the audio to the layout that best fits your space. Easily connect and manage Bluetooth devices. With the all-new Bluetooth menu, you now have deeper management over Bluetooth devices allowing you to set up and configure Bluetooth connected headphones and other enabled devices. You can even customize the list of connected devices so you have instant access to devices you use most. Create custom names for every and any input. For every device you can connect to your Bluesound Player, you can now rename it to whatever you like using the settings menu in the BluOS app. Connect your television to the soundbar and rename the optical input to “TV,” or connect a CD Player and call it the name of your choice—it’s that simple and easy. We’re always making the BluOS experience better. To enjoy the latest features and enhancements, be sure to always upgrade your Players and apps when prompted.